1. What do you think of Star Fox's Image? I think he looks like an Angry Kitten. It should be "Star Angry Kitten: Armada"
2. Isn't such a question... more of an observation. Peach and Daisy remind me ALOT of Jessica and Ashley Simpson. Jessica/Peach - Blonde, Good looking, thin, not so bright. Ashley/Daisy - Brunette, Ugly, Not Good Looking, Dumb. Sapphira: 1 and 2) No. MEGAß¥TE: 1. I thought that the Rare Fox McCloud model was excellent, and the Namco one not so much... while the teeth have been made fun of in the past, it's the mohawk that bothers me the most. I don't understand why they got rid of his helmet from the original, especially when he's performing personal combat in this game, where he would need a helmet more than ever. Congratulate me! I bought a GBA link cable off the internet! Will Nintendo make anymore 2player games for GBA? I don't want to spend $1,000,000,000.00 on a DS. Lizard Dude: Congratulations! I'm sure they will, and have you tried all the multiplayer GBA games already released? MEGAß¥TE: Who's making you pay $1,000,000,000? The highest I've seen them for is $10,000. I bet no one has ever noticed this before, in SMB3, the islands of pipe land are shaped like three warp pipes! cool huh? Deezer: I noticed it when I scrutinized all the map screens in NP's SMB3 guide after I thought that World 4's map looked like some kind of turtle. But I'm sure someone noticed it before me. MEGAß¥TE: I would recommend that you not visit a casino. This may seem like an odd question, but how many coins are in Super Mario World and Yoshi's Island? I have totals for the other games in the non-handheld Mario series except these. Deezer: Maybe someone with more OCD than me can help. Assuming you don't have the players' guides, I think this would be the easiest way to do it: (1) Download SMW and Yoshi's Island ROMs. (2) Download SMW and Yoshi's Island level editors. (3) Count. 1. What are your comments about Mario meeting up with real-life people? Wouldn't that mess up his reputation or something? It's kind of weird just seeing some animated 5 foot plumber running around the courts. 3. Just wondering if you people know anything about when the DS may come online?...I keep hearing rumors about it being online and what not...just wondering if you knew...cause when Mario Kart DS hits the stores...I'll be sure to buy that one, especially is the DS online-ness is successful!...this one looks worth it! Hope you guys have seen the vids! Yours truly..."Marionater" of the Fungi Forums...AND the Nsiders from Nintendo. Deezer: 1. I don't think I'll ever get used to Mario, Luigi, and Peach shooting hoops with polygonal versions of NBA's hottest stars of today. 2. Depends on how many passes we can get from Gamespy. Sapphira: 1. What Deez said. This is one of those games I definitely view as non-canon. I also see it more as a cameo appearance, not as something classified as a "Mario game." 2. Pretty much all of us are planning on going already, but, yeah, it depends on the number of passes we can get before we do anything more. I've never seen nor heard of a "Marionater" on the FF. Just a few things I've noticed just recently on TMK, why is Donkey Konga considered a spin-off, yet the DKC games are not? I'm not saying that you are being biased or spiteful or anything like that. I just found it odd seeing Donkey Konga has a slew of DKC characters and just a couple of Mario references which are even less than the ref. in the DKC games, yet it's considered a spin-off. I'm also pondering on that comment one of you guys said a couple of mailbags ago when you said that DK was merging with the Mario franchise. How? Mario vs. DK was more of a sequel or port of Donkey Kong 94, DK is appearing allot less in the Party games and King of Swing and Jungle Beat seem to have no trace of Mario whats-so-ever, even if the director of SMS is making Jungle Beat. Also, how do you feel with all these third party games featuring Mario? I'm actually really looking forward to DDR with Mario seeing it has some of the best remixes of Subcon to date and Konami is such an awesome company, but how far do you think this will go? I'm looking at that EA basketball game when I say this, seeing Mario and gang look COMPLETELY out of place, and seems like they are only there to make up of lack of internet play. It's fun for now, but I don't want these games to over-shadow Super Mario 128 and Super Mario Bros. DS or what ever else Nintendo has planned for Mario. And last but not least, why do you guys seem to dislike Waluigi so much? He's just like the loveable Wario... But Luigi style!!! Besides, he isn't the real cameo game enemy, that stupid giant obese plant PETEY PIRANHA IS!!! Deezer: I guess I consider the platform games and early arcade games to be the heart of the Mario universe. Everything else just seems like, "Hey, I have an idea for a game, but let's put Mario characters in it so it sells more!" As for Kongs merging with the Mario franchise, I don't remember who said that, but I think one example is Diddy Kong appearing in Double Dash and Mario Power Tennis. MEGAß¥TE: The DKC games just haven't all been added yet. Why don't I like Waluigi? You're right, he's like Wario, but Luigi style. In other words, two crappy characters in one! Seriously though, the addition of Wa- characters got to be a little much, plus I hate the character design of Waluigi. Chupperson: I basically consider what Deezer said + the Mario Kart games to be the "main" Mario stuff. And Luigi's Mansion, if that doesn't fall under the "platform" category. did you know that this is the perfect time to start a rumour about Waluigi being a playable character in Mario 64 DS (or even as a non-playable character maybe ?) and well.... Eventually the rumour of Luigi being in Mario 64 isn't a rumour anymore. Deezer: It is never a good time to spread misinformation. MEGAß¥TE: Did you know that this is the perfect time to bludgeon yourself to death? (This is not serious) I have used my skills in predicting the future to do what everyone else would. Predict the future of the TMK Mailbag. Here are some predictions. Waluigi is really in Super Mario 64 DS e-mails will become the scourge of the future. One person will find a "7 is real- 2049" texture in the game, until it is found out he drew on the screen with magic marker. List e-mails will become even worse, spanning upwards of 1000 questions, with such important questions as "What flavor grape jello do you prefer" and "Why do my feet hurt"
Mario "Cameo's" will get more and more stupid, until a message claims Survivor has a Mario cameo because it has blue colored things in it. And blue is in Mario games. People will find "Mario is Missing" and declare it a classic. Until they forget to breathe because they're so stupid. Deezer: For some reason my brain read this like a Conan O'Brien "In the Year 2000" skit. MEGAß¥TE: As you can see above, your first prediction is already here. The second has also already happened to a certain extent, but we won't let it reach 1000 questions. The third has practically happened as well. Lizard Dude: I prefer mint grape jello. Hello ^-^ I have only recently discovered your site in my pathetic desperate searches for fan art (half is looking for inspiration and half is just me being the total geek I am) and I think it's great. I was wondering, though, if you could tell m the basic climate type and whatnot for Sarasaland. I was writing a fanfic with Daisy as one of the main characters and thought of mentioning something about Sarasaland... and realized that, having never actually played the game, I have no idea what Sarasaland is actually like. And now it's driving me bonkers XP So, if anyone had any idea on that, I'd really appreciate it if you could give me some idea of how to describe Daisy's homeland ^-^ Also, I'd like to take a moment to vent... (don't worry, I promise I'll be brief ^-^) Nintendo is making Luigi seem more and more... well, to be blunt, gay. It's one thing making him jumpy and a scaredy cat; it gives him a more defined character. But seriously, in SSBM his moves were all... girly, and in M&L:SSS! he was all over Peasly. Eurgh. So... that's just my opinion. Anyway if you could please let me know about Sarasaland, I'd really appreciate it ^-^ OH yeah! I just remembered what else I wanted to ask! Does anyone know Daisy's last name? 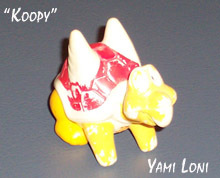 I've heard about a hundred different ones in fanfics, and I wanted to know if Nintendo had actually had a last name for her. Okay, I promise that's all I'm going to write... For now.... XD Heh. MEGAß¥TE: You should play the game. Sarasaland is divided into four kingdoms, Birabuto, Muda, Easton, and Chai. Birabuto is similar to Egypt, Muda is a watery world, Easton is similar to Easter Island, and Chai is similar to China. Daisy has never had a last name named. I also find your sexual identity comment regarding Luigi rather ironic coming from a guy named AmazeeDayzee with a rose in his signature (this is assuming that your From: name is correct). Yeah, the sighting is me, as Mario! Ya see, for this "Japan Culture Convention" deal My friend and I went as videogame characters, I went as Super Mario from SMW and he went as Link (I know he's missing the hat, but the person that had it didn't get there until we had already taken those pics). I made his shield and sword out of some construction paper, and I think it came out pretty good. But I digress, and move on to the other picture, which is of part of my room. The bookcase you see there houses some of my Mario stuff, such as Clothes, Books, toys, stuff animals, vids, etc. that I have been given and collected since I was 3 years old, I even have some Mario jammies. Anyway, my room is full of Mario posters and promo stuff. anyway, I just wanted to show that I am a true blue Mario fan, and even around my friends and family, I am not known as Jesse, rather, I have a more well-known alias: Super Mario. Or "that loser that likes Mario". Same Difference. Anyway, Enjoy! Deezer: Ahahah, who brought the fan to blow your cape? Chupperson: Wow, that's awesome. The Link stuff reminds me of when I saw some kid playing in the street with some other kids the other day. He had a pretty well-made cardboard Master Sword and Hylian Shield. I'm probably not the first person to email you about this, but the Foxtrot comic for Febuary 1st, 2005 features a rather blatant Mario reference featuring the characters Jason and Marcus trying to cope with having to go outside instead of playing video games. The comics for the rest of the week also appear to make references to other well known games. MEGAß¥TE: You were neither the first, nor the last. I thought that this comic was pretty stupid by itself, until I read the continuation of the strip through the week. All together, the set of strips is funny. Hi, TMK, i just wanted to tell you in case you didnt watch the Simpsons Super Bowl Special that Mario appears in it. Homer does a stupid dance that is shown all around the world and everyone loves it. Eventually, people from all over the world come to see him. He's taking out the trash when a tour bus stops to take pictures of him. One of the tourists is Mario. He runs out the bus yelling, "Basta! Basta! "(stop) "Take a picture of me with him! "( something like that) Homer goes on a rampage and starts throwing trash cans at him , you start to hear the DK level theme. Mario runs up bart's tree house and grabs the hammer and starts destroying the trash cans but gets hit in the process. When he gets hit, he goes into his Spin Around Death Sequence. MEGAß¥TE: Yes, we posted this on the front page. I'd like to ask everybody to STOP sending sightings to the mailbag. Send them to Lizard Dude instead. 1. Why does everyone hate Waluigi so much? Just because he only appears in spin-off games doesn't mean that he doesn't deserve to exist. 2. Let's imagine for a moment that the guy in Mario Lottery is real and not a goof by bootleggers. Is his name Frederico or Francesco? Who do you think he might be? 3. I found this on SMBHQ: "This is a weird memorie one time I played mario 64 and had 120 stars then my cousin called he said I can get luigi on mario64 he told me how to get him he said have 120 stars and talk to yoshi then he hung up.So I did what he said I went inside the castle and then I heard Luigi's voice then mario talk to him and he said he join mario.Then I reset the game and I open the that has 120 stars and then a screen came up to select ethier mario or luigi I select luigi and he was a high jumper and he was skinny I use him and he was better the mario.Then I reset the game again and it says I can choose mario and luigi at the same time and I choose them and I controld both of them this was the weirdest memorie ever." What do you think? MEGAß¥TE: 1. No, he doesn't deserve to exist in spin-off games either. 3. I think that's dumb. P.S. HOW HARD IS IT FOR YOU TO E-MAIL THE PROPER MAILBAG ADDRESS? I know you guys are usually really busy, and this question may seem a little tedious, but why are there no songs from Mario and Luigi: Superstar Saga? I really loved the music on that game, and it sets the bar for music (and gameplay too, of course) for other GBA games. MEGAß¥TE: We were waiting for a soundtrack release. It's out now, so hopefully David will get it on WTMK soon. Lizard Dude: "(1) A DS with SM64DS, flannel pants, sweatshirt, chocolates, cow pi shirt, A Brave New World, The Man in the High Castle, 2005 weeds, water and invasive species The Montana Noxious Weed Calendar, and $50." .....does lizard dude smoke weed? ps. : i think the Super Princess Peach game is going to be paper-mario-ish... if it is i'll bye it! pss. : did you notice how one of the crows in paper mario 2 were talking about that new fiber-optic internet accsess(<-spelld rong) thing? psss. : tmk rocks! Lizard Dude: No, I smoke water and invasive species. Deezer: P.S.S. I noticed. The crows had some truly bizarre dialogue. I carried this little piece of plastic everywhere. As you can see from the picture, much of his paint has chipped off from the wear-and-tear of my daily playing. I am planning a reconstruction on him to bring him to his former glory. That just goes to show how influential Nintendo and its many wonderful products have paved a few stepping stones in my life. I hope to hear from other people, in regards to this letter, of similar stories. P.S. I will always trust the fungus. The fungus never lies. Deezer: Your letter got me thinking: Why didn't I ever get a SMB3 Happy Meal? 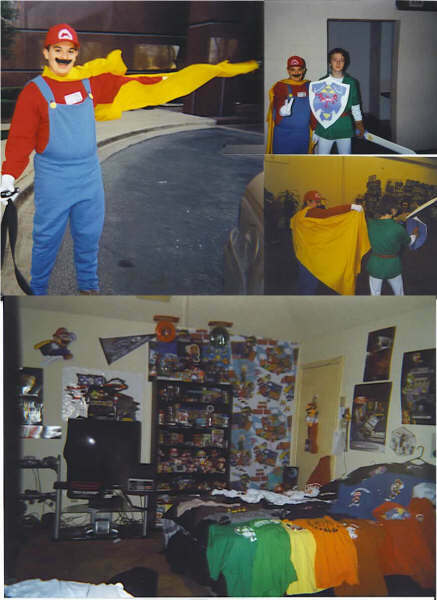 I never came up with an answer, but I remembered some things that show how Nintendo and Super Mario shaped my life. Not long after I persuaded my parents to buy an NES, which came with Super Mario Bros. and Duck Hunt, the addictiveness of Mario's world took a hold of me. Nintendo Power's preview of Super Mario Bros. 3 never left my side, in case I wanted to sit and stare in awe at the fancy new suits some more. In the Super NES days, my best friend and I spent entire Summer vacations playing Super Mario Kart and Super Mario World, perfecting banana peel direct hits and showing off all the bugs we knew. Years later, Mario Kart 64's four-player mode provided more fun and recharged my addiction to the series. These experiences obviously had a lot to do with the creation of TMK, which seemed like the next logical step to take. MEGAß¥TE: I think they would have had to add an actual copy of SMB3 to make a meal from there "happy." Chupperson: I have that Paratroopa. Actually I have all the McDonald's SMB3 toys... I got the Goomba when I was like 5. Or 4. Lizard Dude: Besides spending so much time and money on the games, I'd say that Mario's biggest influence on my life was getting me to dress up as him and learn many of the songs on piano. I know I have that Paratroopa (sans pump) and the Racoon Tail Mario (sans spring) somewhere. MEGAß¥TE: I still have those coloring books in a box somewhere. Keeping them for a mechandise update one day.